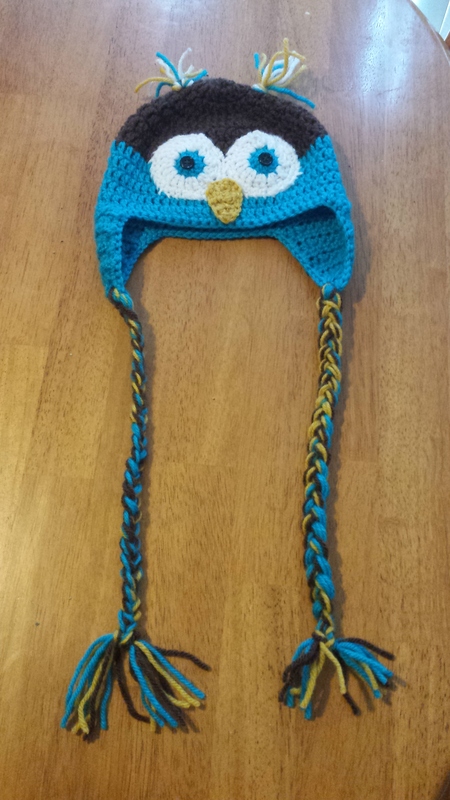 I wanted to make an owl hat, so I did! Sorry I haven’t been on in a while. 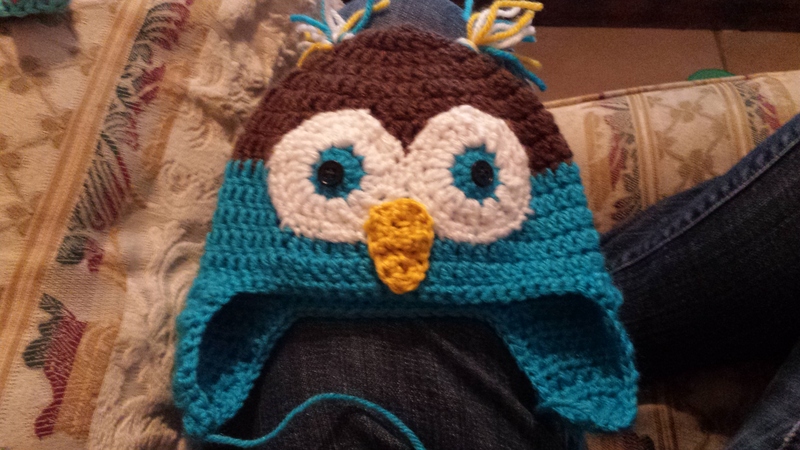 There’s not much to share when I’m just working on hat and scarf orders. 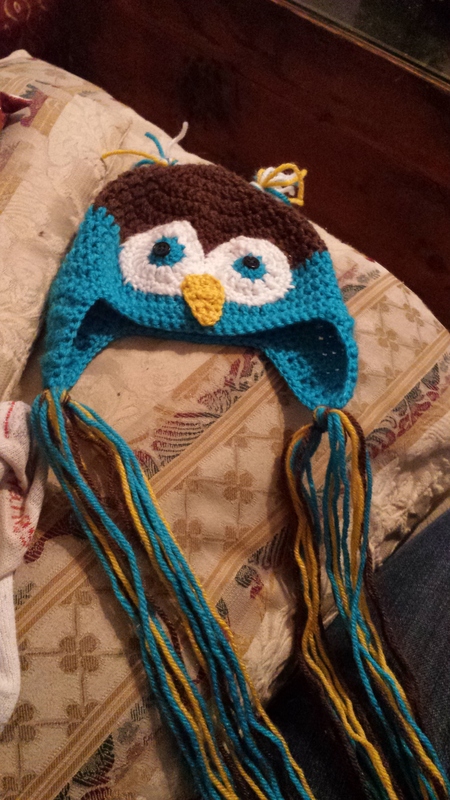 But I finally started a baby blanket for my cousin (intentionally, instead of the few “I have scraps and will totally remember what they are and buy more” attempts), and I made a hat today that I’m super proud of. My best guess was that this would be 6 by 6, because this was 6 squares lined up. Not quite big enough, but the edging would certainly add some size! 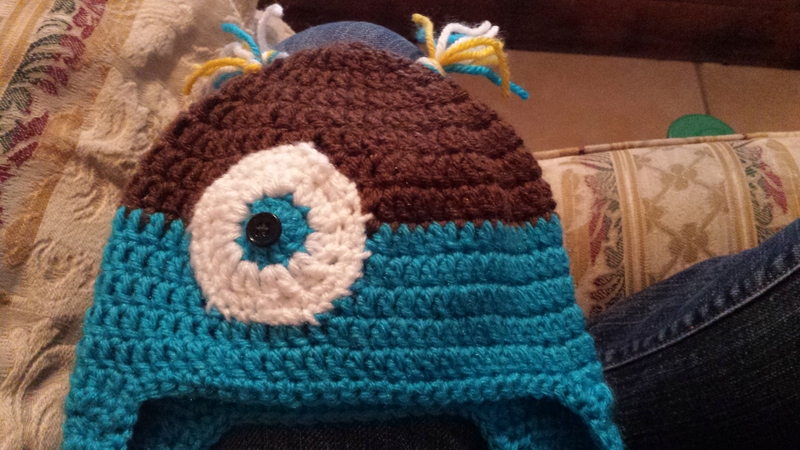 Plus, the edging adds a LOT of size. 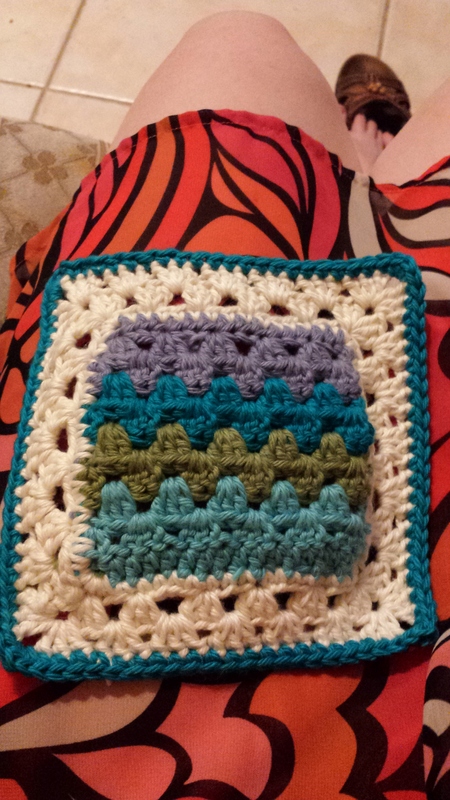 So instead of 36 squares, I’m pretty sure this will be plenty big with just 25 squares, 5 by 5. I’ll take a picture when I have 9 done so I can show the height/width I think will work. 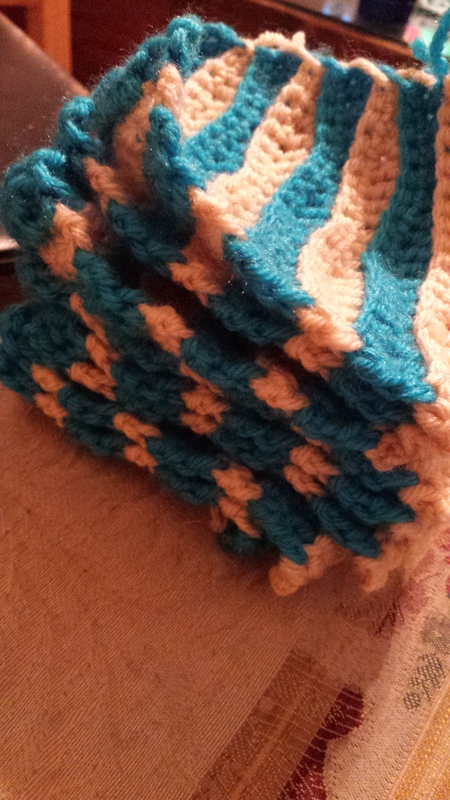 I’ve been doing a square between each order–they don’t take long, and it breaks up the monotony of hats and scarves. 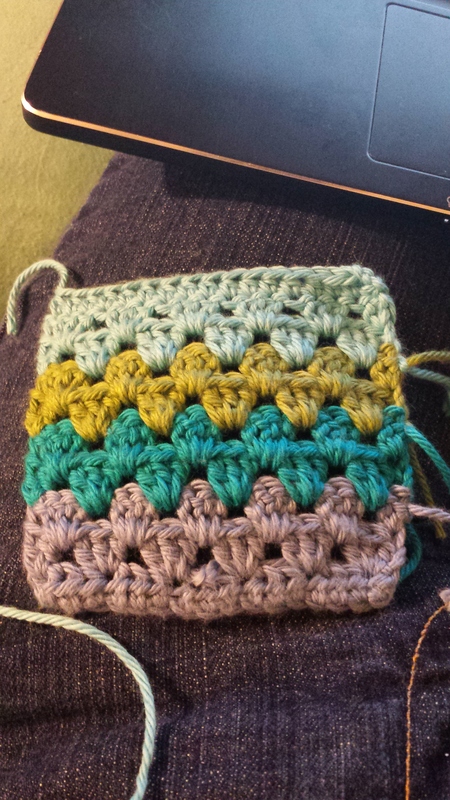 This morning, however, I didn’t want to do another square for my “break”. 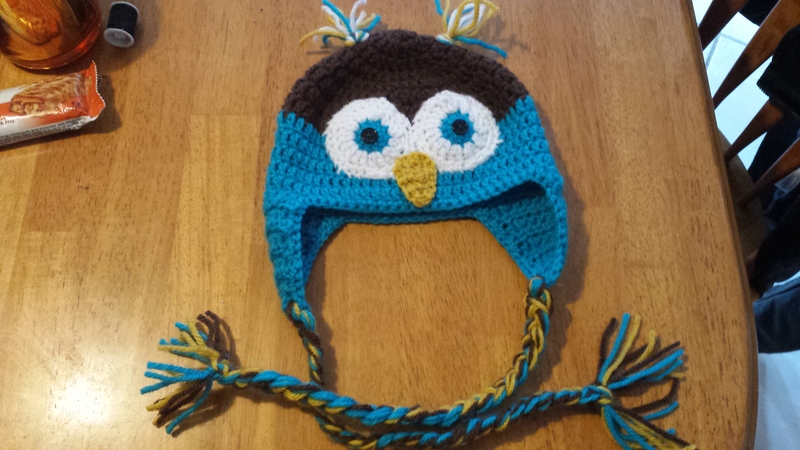 I looked on Ravelry and the top pattern in my search caught my eye immediately: an owl hat! Hey, look, eyes! He looks kinda crazy, but definitely more owl-like. Two eyes looks better. Don’t ask why this picture looks blurry, I have no clue. There’s the owl! The beak really makes this great. The braids, pre-braided. This was hard to braid, trust me. So many strands! But it was worth it! 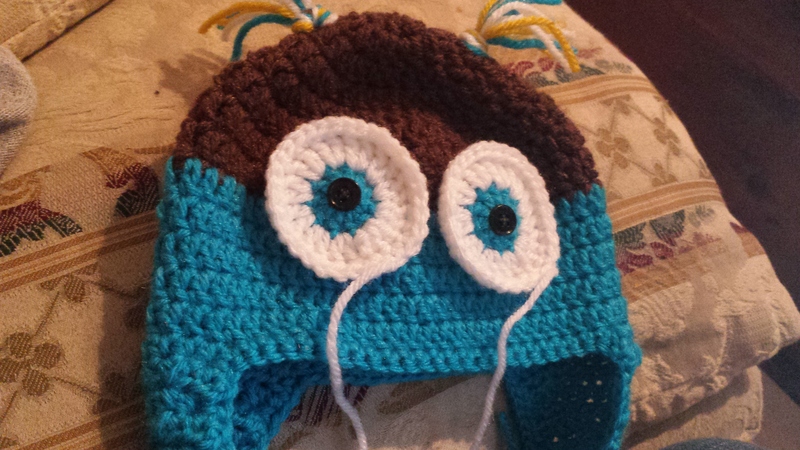 He has nice long earflap braids, and he looks SO CUTE. I loved this whole thing, beginning to end. 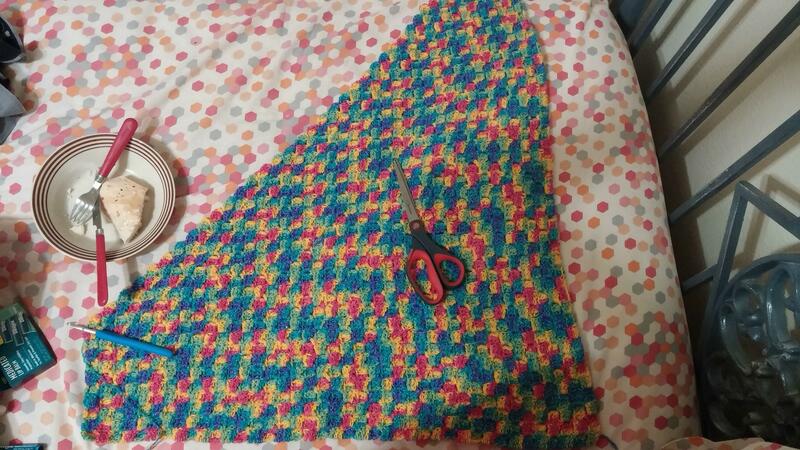 Half done with the baby blanket! This is why I do baby blankets. They work up so quickly! And this Wavy one is one of the fastest I’ve ever done. I remember that from the first time around. I started this yesterday, about this time. 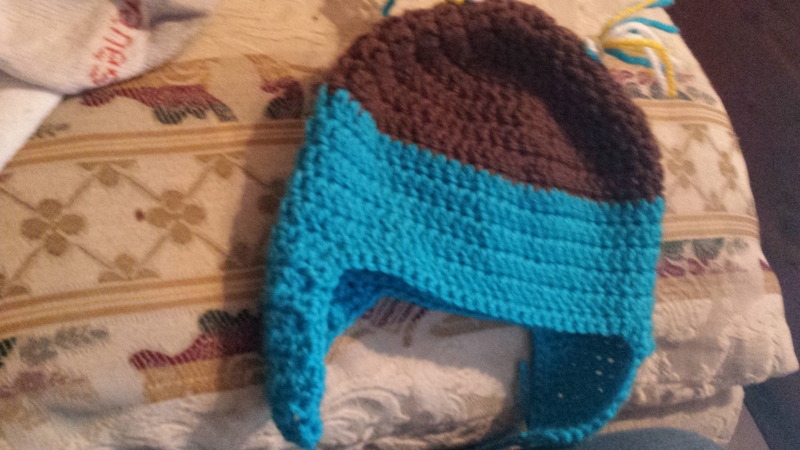 I think I’m going to use a different blue for the remaining 8 because I have a light blue of the same yarn and I feel like it would look cool. I’m gonna go start on that. Rainbow square 2 and another project! 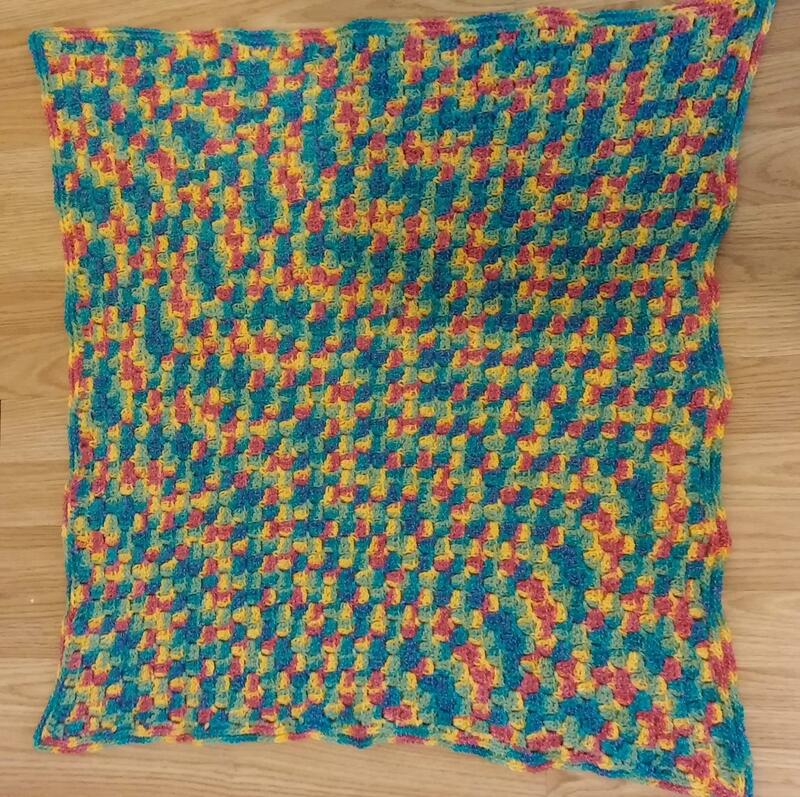 It’s not very unique, so I’ll just show you–I finished the second square of the rainbow C2C blanket! They look a bit weird right now but I might try blocking to see if they get nice and flat…although I’ve heard it might not do much with C2C. But I feel like they’ll look better once they’re joined in a blanket and bordered and everything. 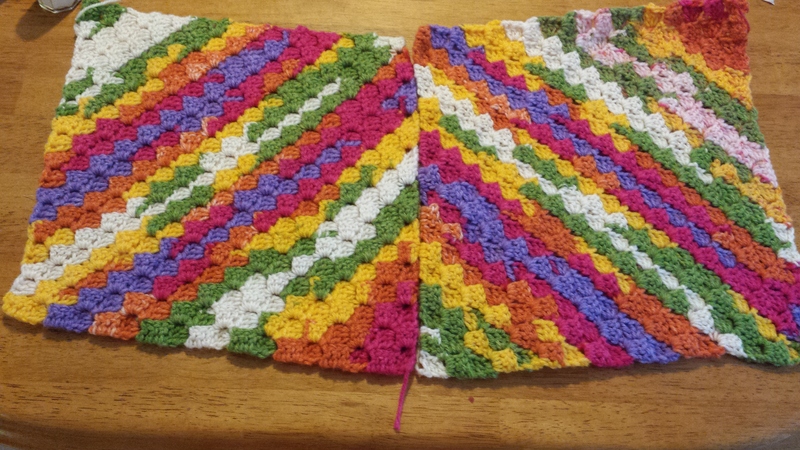 Oh, and to use all my Vanna’s choice that I bought for the rug that never happened…I found a baby blanket pattern that I did once a long time ago and loved! Moogly’s “Wavy Baby Blanket”, it’s really fun. 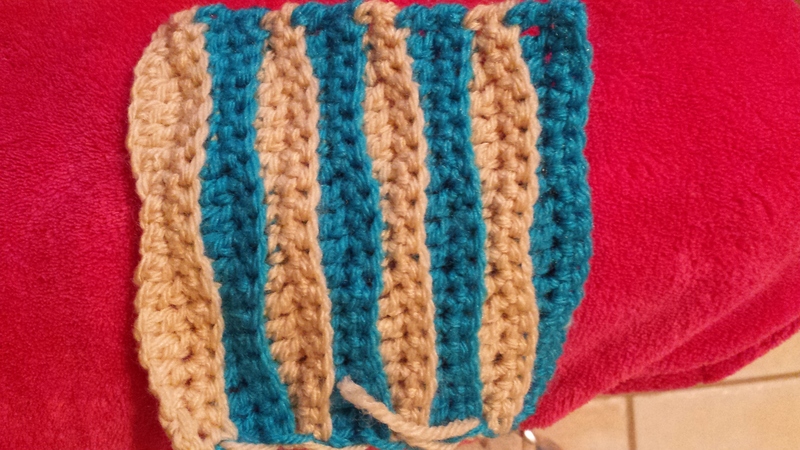 I think I’ll do half the squares with this tan/medium blue, and then the other half tan/light blue. And probably green or purple for the outline/joining color. 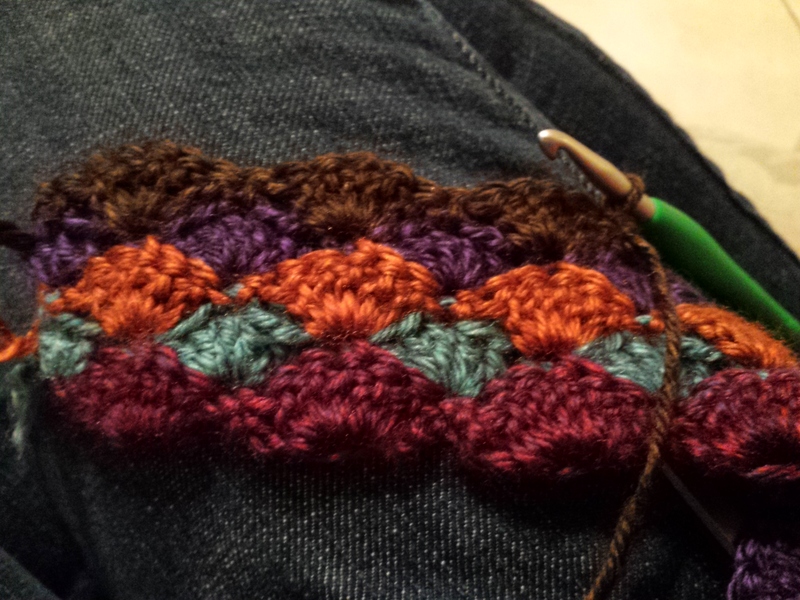 This pattern works up very quickly and looks so cool! Anyway, nothing of much importance to say today. I’m gonna go back to working on this baby blanket. See you later! My husband has actually had days off this week, which is a phrase he barely remembered the meaning of since he started his second job. 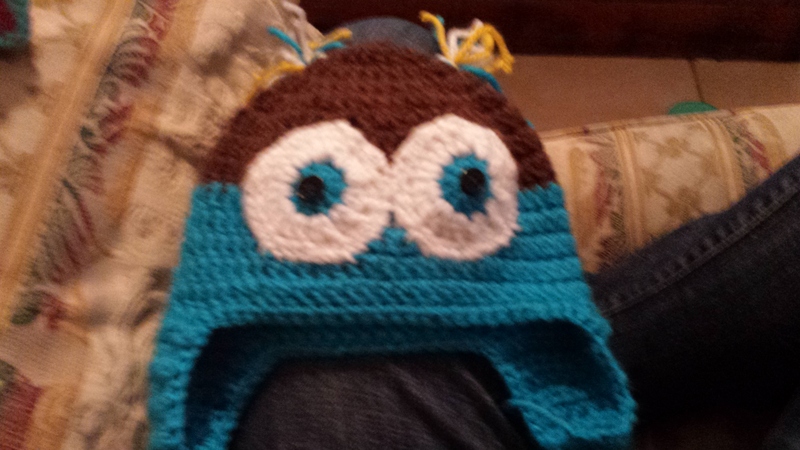 So I haven’t been crocheting too much because I’ve been able to actually spend time with him and run errands and stuff. 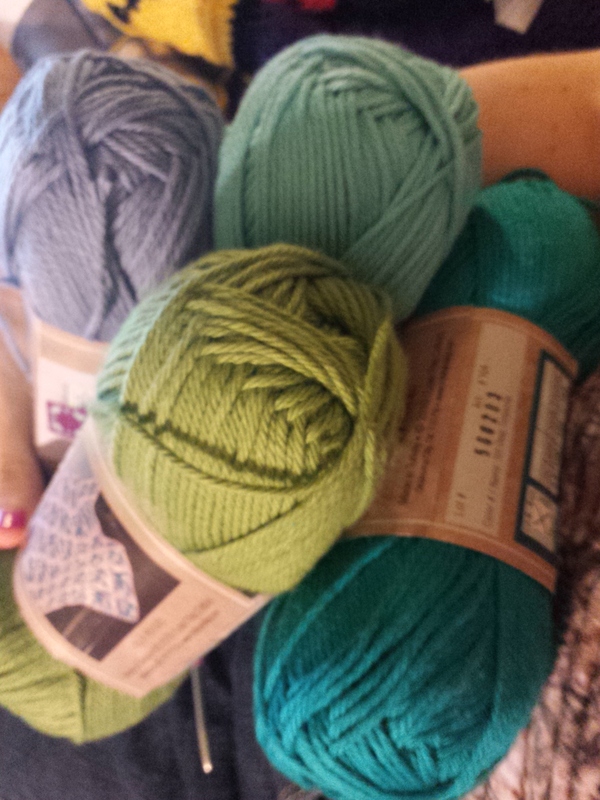 Anyway, they had lots of yarn. I took a long time to browse, considering they don’t really have much of a selection there yet, and kept looking at the Heartland. I’d only used it once before, the brown for my baby Groot a couple months ago. It was soft and I liked it, so I knew it was a decent yarn. And I am in love with jewel tones, which is a lot of Heartland’s colors. So I figured I might as well grab a few balls of it and use them with the 3/4 ball of brown I still had. Freaking gorgeous, right? I had to wind it first because I loathe working with non-center-pull balls. I struggled for hours to pick a pattern, and eventually chose a shell baby blanket. I’ll probably bring it in for consignment when it’s done because there’s only one upcoming baby in my extended family and I have another blanket in progress for him/her. Right away I was in love. 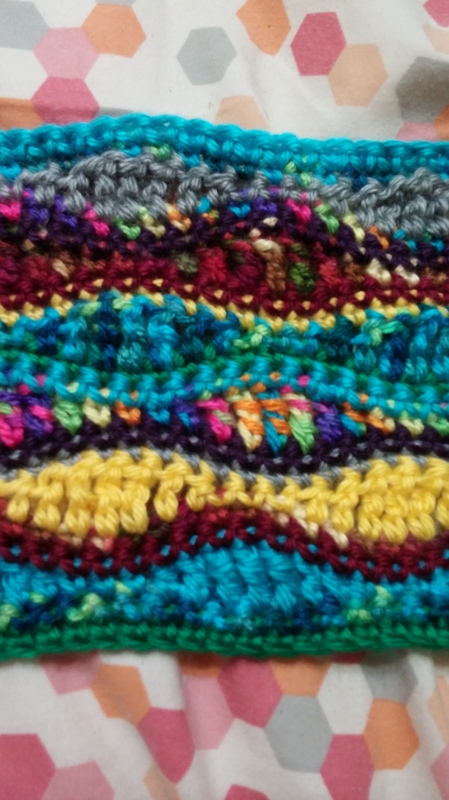 The pattern is the “Beachcomber Baby Blanket”, and I found it through Ravelry. I’d link it but from Ravelry I followed a few links to get to a free pattern PDF, so I’m not sure what part I would link to avoid getting in trouble with the creator. Just search it on there, I think it’s pretty popular so it shouldn’t be hard to find. The colors work together, too! I think after this picture I decided I didn’t like purple and brown next to each other and changed the order. 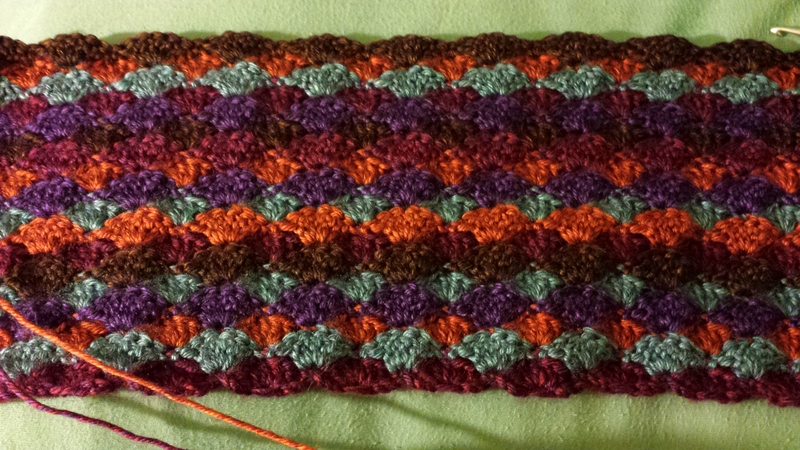 I didn’t want a “striped” look to it (same color order throughout), so I’m kind of doing it with a “random” order. Essentially, as I finish each row I look for what color I haven’t done in a while or haven’t done next to the color I just finished recently, then I join in that one and go. I, for one, love it. It’s not really a traditional baby color scheme, but I think it’s still pretty. If I named my projects I would call this one something to do with jewels/precious rocks in the dirt. That’s all I can see when I look at it, and is also exactly what I intended with my color choices. About $100 for a pair of jeans, a cami, 5 Blu-Ray/DVD combos, a jean jacket (denim jacket, can’t remember if jean jacket is the normal name), pair of sneakers, ornament for my mom, and some chocolates for my husband because we never find them and found his favorite brand. I consider that a huge success. Anyway, have a great post-Thanksgiving weekend! I hope you’re crocheting a lot while you recover from feasting/shopping and hide from all the family in your home! 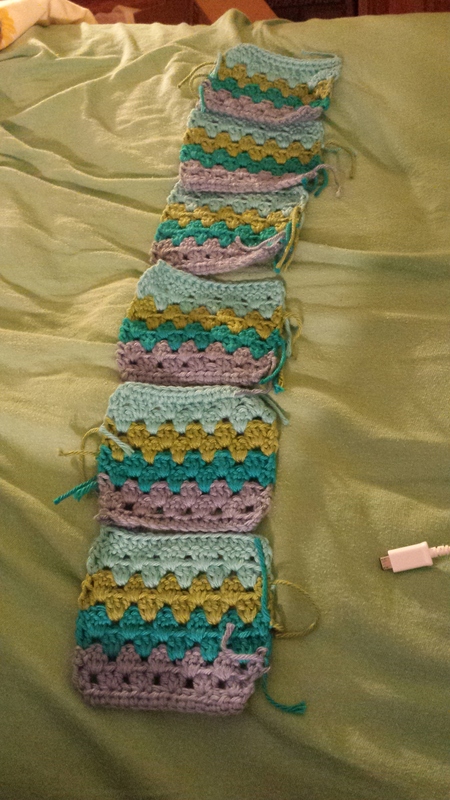 The baby blanket is DONE!…And I may have started another one. Why do I only have the dedication to finish blankets that aren’t for my personal use? I realize the edges are kinda weird. I tried to fix that in blocking, but I don’t have enough foam mats to block pretty much anything but a scarf, so it took some creativity and ended up making the edging more wonky than pre-blocking. I’ll hopefully afford more mats soon and re-block this since I hope to sell it. 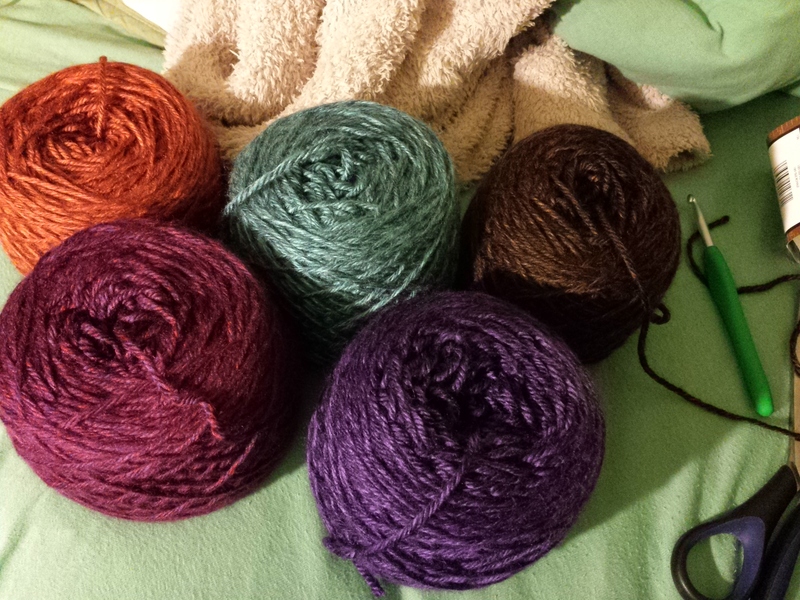 Shut up, it’s really hard to get a picture of rainbow yarn. This pic was partly to show you the cool edging, and partly to show the random way that the colors lined up for this section. I didn’t really enjoy that, I liked the odd pairing, but it only lasted a few inches and then it was back to my weird edge again. This blanket ended up starting a phase for me, though. I’m now addicted to baby blankets. I am not pregnant, nor is anyone I know at the moment. But they’re so fun to make! My best theory is that you get the experience of an entire project in such a small size. Like I get to start something new, work on it for days, and just when I would get tired of the full-size blanket, I’m done and it’s time to block! 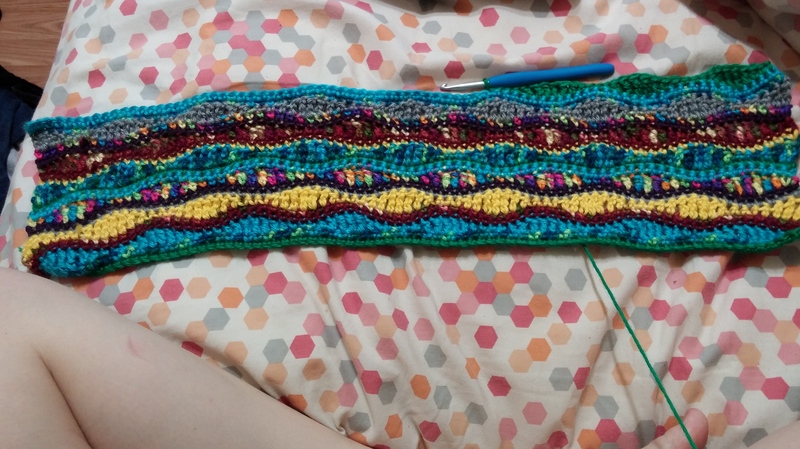 So once I finished the rainbow one last night and got it blocking, I had the urge to start a new one already. Totally weird, right? But I can’t look away. It’s disgustingly beautiful. It’s so wrong, and yet so right. At this rate, I may end up with an Etsy store of entirely baby blankets. And I am completely ok with this. Ok, so I decided that although I love rainbows, I simply would not really use a giant adult-sized rainbow blanket. I’m trying to dress and decorate in a more mature style, so this wonderfully clashing blanket wouldn’t really work. 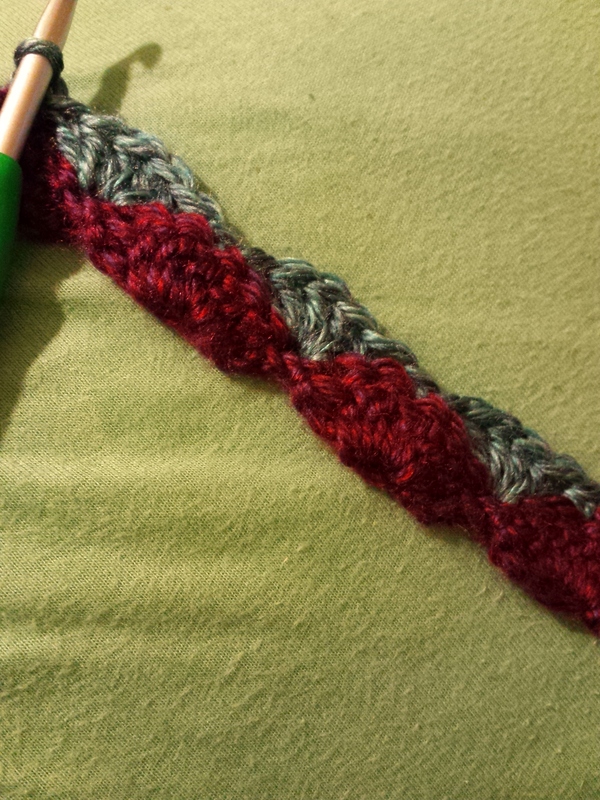 Therefore, I’m making a baby blanket with half the yarn. The other half will either be another baby blanket, or some new project I don’t even know about yet. Disregard my lunch in the photo…sorry I can pretend the bowl is for scale. 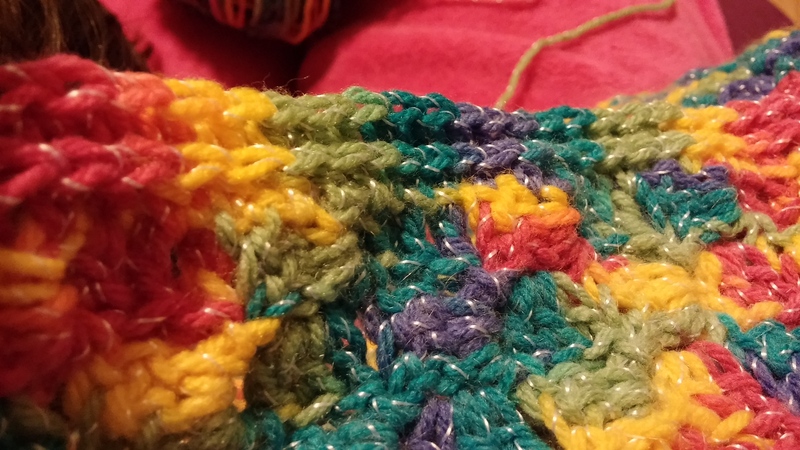 These colors all combine to create a chaotic mess of a blanket, and I love it to death. I plan to binge on Simpsons episodes and try to finish this darn thing in the next 5 hours before I head to work.